The end of criticality has been declared more than once in the architectural discourse of the late 20th C. This regards both: architectural practice and the critique of architecture itself. More recently the status of criticality has been restored after the era proclaimed post-critical has passed its peak. Criticality has increasingly turned into a medium of resistance set against an economic system of unified standards in the architecture world globally. Focussing on history and political critique of architecture today means therefore to seek anew for a contemporary relation of architectural theory to practice, and of architectural practice to the real (or realpolitik). 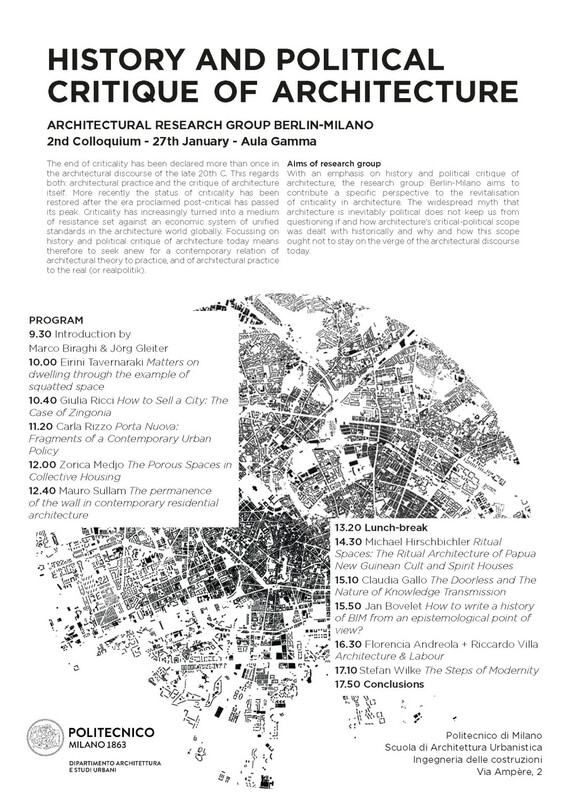 With an emphasis on history and political critique of architecture, the research group Berlin-Milano aims to contribute a specific perspective to the revitalisation of criticality in architecture. The widespread myth that architecture is inevitably political does not keep us from questioning if and how architecture‘s critical-political scope was dealt with historically and why and how this scope ought not to stay on the verge of the architectural discourse today. 15.50 Jan Bovelet How to write a history of BIM from an epistemological point of view? Posted in articles and tagged berlin, history, Jörg Gleiter, marco biraghi, political critique, tu berlin. Bookmark the permalink. Howdy! I just noticed your webpage: %BLOGTITLE% when I was exploring digg.com. It looks as though someone liked your site so much they decided to bookmark it. I’ll definitely be returning here more often. I simply want to mention I am just beginner to blogs and definitely enjoyed this blog site. Probably I’m likely to bookmark your blog post . You really come with amazing well written articles. Cheers for sharing with us your web-site. Entre las pruebas aportadas por García Montes se detectó la presencia de los mismos mi. ue ambos retomaron la marcha hicieron saltar las alarmas que pusieron en marcha un dispositivo que se saldó con su detención ya en Camponaraya. Very efficiently written information. It will be useful to everyone who employess it, as well as yours truly :). Keep doing what you are doing – looking forward to more posts. This is taking a bit even more subjective, but I considerably like the Zune Current market. The interface is colourful, has further flair, and some interesting characteristics such as ‘Mixview’ that allow for yourself instantly perspective identical albums, music, or other customers very similar in direction of what you happen to be listening toward. Clicking upon a person of these will centre on that products, and one more mounted of “neighbors” will occur into watch, allowing oneself to navigate more than studying via related artists, songs, or customers. Talking of users, the Zune “Social” is additionally exceptional exciting, allowing on your own find others with shared tastes and getting to be close friends with them. On your own then can listen in direction of a playlist produced primarily based upon an amalgamation of what all your good friends are listening in direction of, which is far too fascinating. All those fearful with privateness will be relieved towards know yourself can avoid the general public from watching your personal listening behavior if you as a result pick. I have been exploring for a little for any high-quality articles or weblog posts on this sort of area . Exploring in Yahoo I eventually stumbled upon this website. Reading this information So i¡¦m glad to exhibit that I’ve a very excellent uncanny feeling I discovered just what I needed. I most certainly will make certain to don¡¦t disregard this site and give it a glance on a constant basis. of course like your website however you need to check the spelling on several of your posts. A number of them are rife with spelling problems and I find it very bothersome to inform the truth then again I¡¦ll surely come back again. Hi my loved one! I want to say that this article is awesome, nice written and include almost all significant infos. I would like to peer extra posts like this . I not to mention my buddies have been reading the good techniques found on your web blog and quickly developed a horrible suspicion I never thanked the web blog owner for them. All of the ladies had been certainly joyful to read all of them and now have simply been enjoying them. Appreciation for genuinely very kind and also for picking out this kind of superb useful guides millions of individuals are really eager to understand about. My very own sincere apologies for not expressing appreciation to earlier. If you are nonetheless on the fence: grab your favored earphones, head down in the direction of a Easiest Obtain and check with toward plug them into a Zune then an iPod and view which a single appears far better toward by yourself, and which interface makes on your own smile further more. Then you’ll recognize which is specifically for on your own. Just wanna input on few general things, The website style is perfect, the subject material is rattling excellent : D.
Its good as your other blog posts : D, regards for posting . “Say not, ‘I have found the truth,’ but rather, ‘I have found a truth. '” by Kahlil Gibran. I will right away clutch your rss as I can not to find your e-mail subscription hyperlink or e-newsletter service. Do you have any? Please allow me understand in order that I may just subscribe. Thanks.